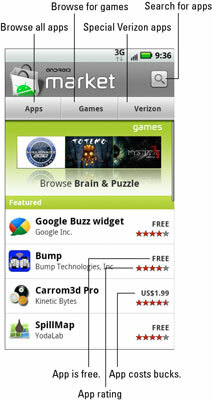 New apps await delivery into your Droid X. To get to them, touch the Market icon (either on the main Home screen or the Applications Tray) to open the Droid’s Market app. You can browse for apps, games, or special Verizon apps by touching the appropriate button. Find apps by browsing the lists. Choose Apps. Then choose a specific category to browse. You can sort apps by their popularity; separate categories exist for paid, free, and newer apps. Search for an app. When you know an app’s name or category, or even what the app does, touch the Search button at the top of the Market screen. Type all or part of the app’s name or perhaps a description. Touch the keyboard’s Search button to begin your search. To see more information about an app, touch it. Touching the app doesn’t buy it: Instead, your Droid displays a more detailed description, screenshots, and comments, plus links to see additional apps or contact the developer. If possible, activate the phone’s Wi-Fi connection. Downloads complete much faster over the Wi-Fi connection than over the digital cellular connection. After touching the Install button, you’re alerted to any services that the app uses. The alert isn’t a warning, and it doesn’t mean anything bad. It’s just that the developer is being honest with you about what the app does on your phone. Touch the OK button to begin the download. You return to the main Market screen while the app downloads. After the download is successful, the phone’s status bar shows the Successful Install notification. Pull down the notifications and choose the app from the list that appears. The app is listed by its app name with the text Successfully Installed beneath it. At this point, what happens next depends on the app you’ve downloaded. For example, you may have to agree to a license agreement. If so, touch the I Agree button. Additional setup may involve signing in to an account or creating a profile, for example. Review the app’s price. It’s priced in dollars, euros, pounds, or yen. You can buy an app priced in another currency; your credit card or cellphone bill is charged the proper amount. If you don’t have a Google Checkout account, you’re prompted to set one up. Follow the directions on the screen. You can choose to use an existing credit card, add a new card, or — most conveniently — add the purchase to your cellular bill. If you choose to add a new card, you’re required to fill in all information about the card, including the billing address. Touch the Buy Now button. After you touch the Buy button, the app is downloaded. You can wait or do something else with the phone while the app is downloading. Eventually, you receive an e-mail message from Google Checkout, confirming your purchase. The message explains how you can get a refund of your purchase within 24 hours.